Preheat oven to 450° F. Brush the crust with olive oil and spread the tomatillo sauce over the Boboli® pizza crust leaving a 1" border. 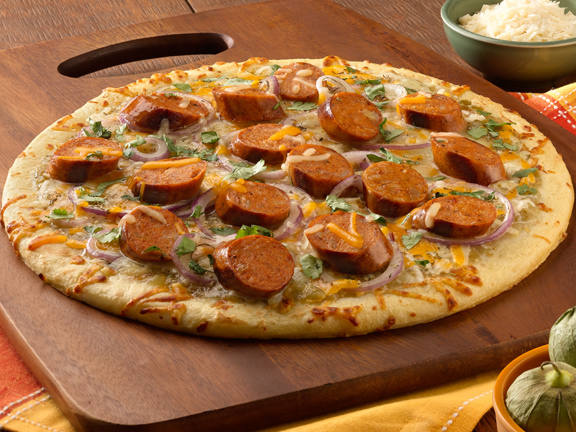 Sprinkle half of the cheeses around the crust, arrange the sausage slices all over the pizza crust. Top with the red onion slices and the cilantro. Add the remaining cheeses to the toppings. Place in oven and bake for about 8 - 10 minutes or until cheese is melted. Remove from oven and let set for 5 minutes. Sprinkle oregano over the top and enjoy!